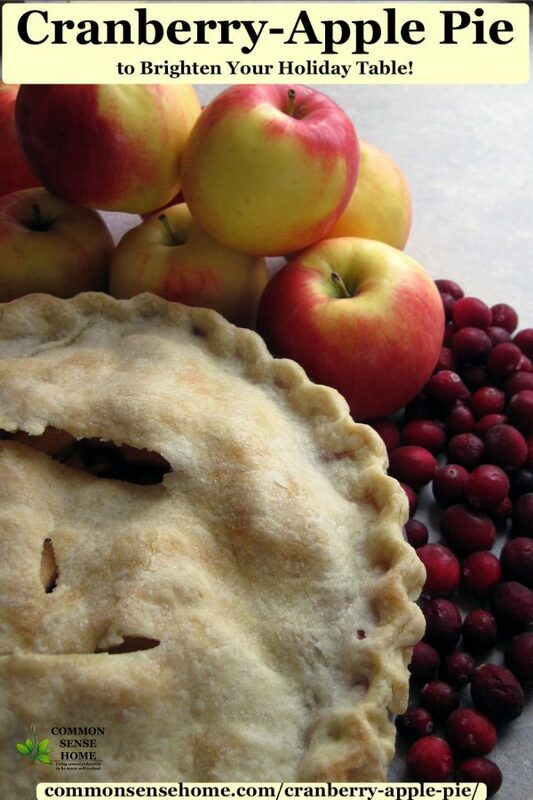 This easy cranberry-apple pie recipe is perfect for the holidays with bright pops of color and tartness from the cranberries paired with sweet apples. There was a bumper harvest of apples this year at my favorite local orchard, and fresh cranberries are shining like rubies in the produce section. Wisconsin is the top cranberry producing state in the U.S., producing millions of barrels of cranberries. I also have a nice stash of local maple syrup, so I figured I'd take a shot at combining all three into a tasty cranberry-apple pie. It turned out quite pretty and pairs nicely with some ice cream or whipping cream. Note – If you don't want to take the time to make pie crust, you can swap this filling into the apple crisp recipe. Peel and slice your apples and dip them in lemon water to prevent browning. (Lemon water = bowl of water with about 1/4 cup lemon juice.) Drain off water and pour apples into large bowl. Add cranberries, toss to mix. Set aside. In a small bowl, mix together cane sugar, cinnamon and cornstarch until blended. Add maple syrup and lemon juice. Mix well. Pour syrup mixture over apple-cranberry mix, toss to coat. Place rolled out pie dough into 9 inch pie dish. Pour in cranberry-apple pie filling and dot with butter. Before placing top crust on pie, be sure to cut some slits in the crust for ventilation, or use a decorative pie crust cutter. Place top crust on pie and crimp together edges, so they just catch on the edge of the pie plate. This will keep your pie from shrinking down into the pie plate. 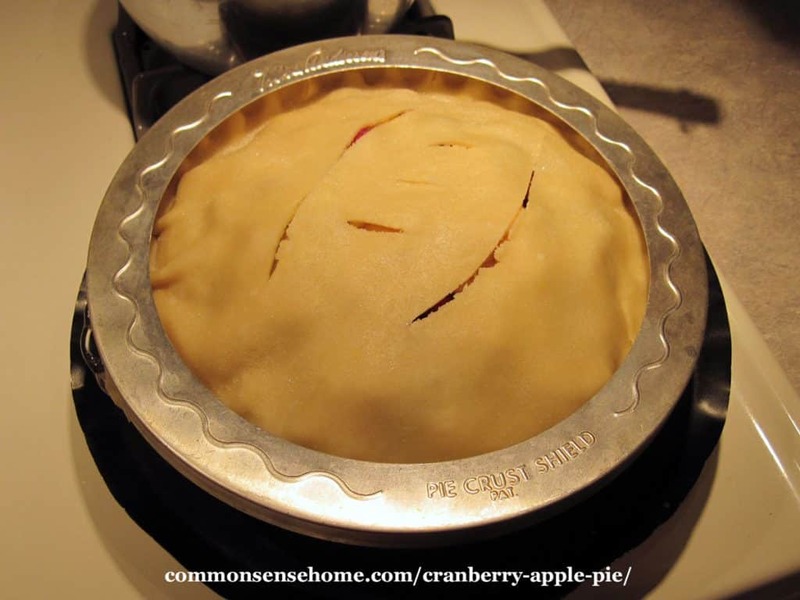 Cover edges with a pie crust shield or aluminum foil to prevent excess browning. I also place a pie drip pan below the pie to catch any spills before they make a mess in the oven. Dust with a sprinkle of cane sugar before placing in oven, if desired. Bake at 375°F for 40-50 minutes, until crust is golden brown and filling is bubbly. Cool slightly before serving. 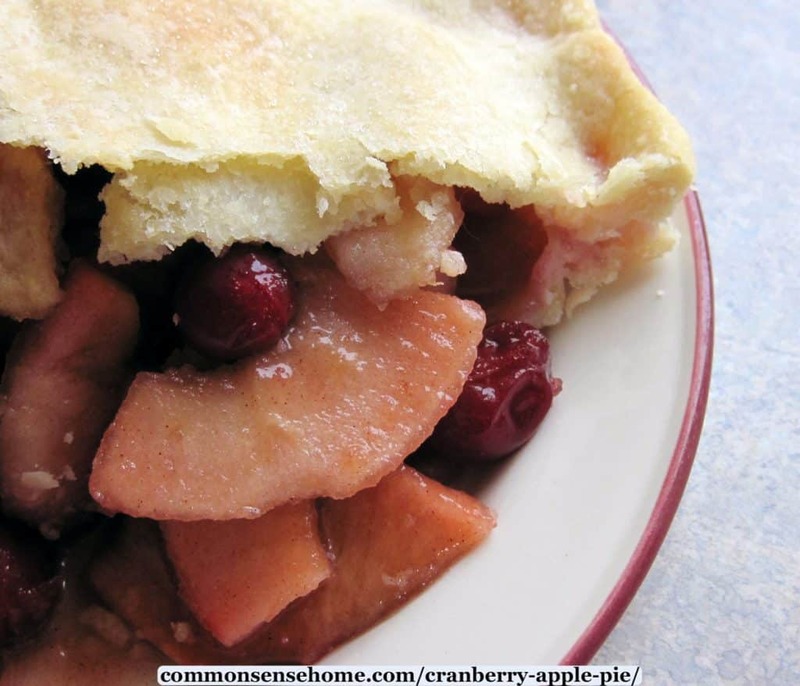 As you can see, the combination of cranberries and apples makes a beautiful filling, and pie crust bakes up light and flaky. The dusting of sugar on the crust adds a little sparkle in the sunlight. Serving with a scoop of vanilla ice cream adds a nice contrast between the tartness of the cranberries and the sweetness of the ice cream. A delicious combination of sweet apples and tart cranberries make this pie a special treat and provide a bright pop of color. Place rolled out pie dough into 9 inch pie dish. Pour in pie filling and dot with butter. Before placing top crust on pie, cut some slits in the crust for ventilation. Place top crust on pie and crimp together edges. Dust with a sprinkle of cane sugar before placing in oven, if desired. Cover edges with pie shield or aluminum foil, if desired, to reduce browning on edges. Bake at 375°F for 40-50 minutes, until crust is golden brown and filling is bubbly. Cool slightly and serve with vanilla ice cream or whipped cream if desired. 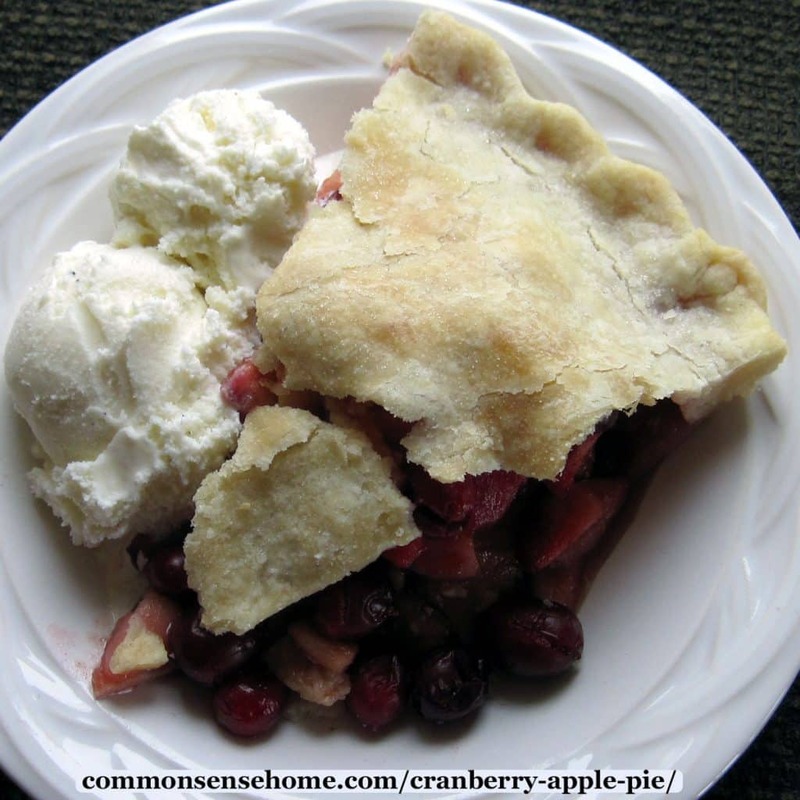 Use a pie drip pan below the pie plate to catch any spills before they make a mess in the oven. The “secret” to a flakier pie crust is to keep your ingredients chilled (use ice water and refrigerated fat) and work the dough gently. You're not kneading bread. I like to use non-hydrogenated lard from the mom and pop meat place just down the road as my fat, or butter and palm shortening. I don't use vegetable shortening because it is hydrogenated, and contains oxidized (damaged) cholesterol. (Grocery store lard may also be hydrogenated – you need to read the label.) You can use all butter, but the crust will be a little bit stickier and tougher to work with. Lard and palm shortening have a more neutral flavor. 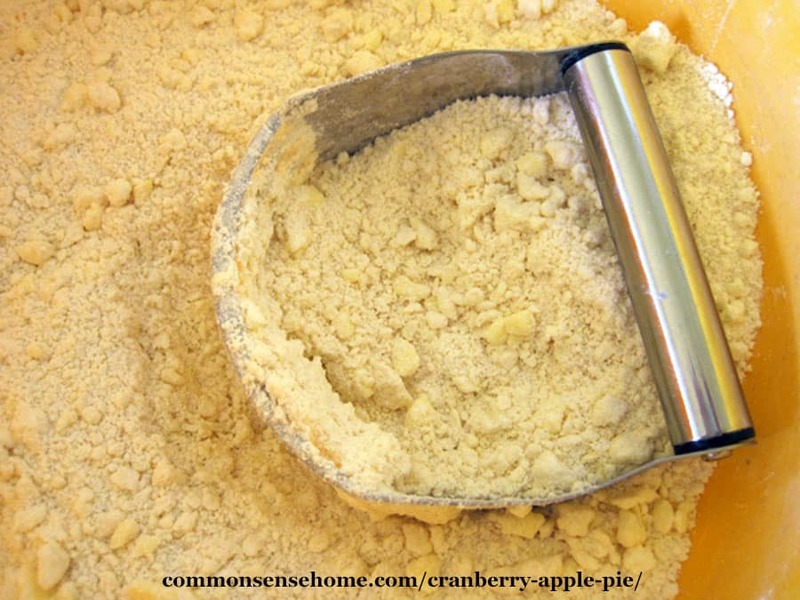 Handle your pie crust gently! I work my pie crust dough in two stages. First, in a large bowl, cut together flour and lard with a pastry blender to form pea sized bits. You can also do this with two knives, a fork or in a food processor, but the pastry blender is my preferred option. Mix the liquid ingredients in a separate bowl (if using Gram Irene's recipe), then cut them into the flour mix with a fork. Work the liquid in using a fork, then finish the last bit of mixing with your hands to make sure the dough comes together evenly. Shape into three even disks for Irene's crust, two for the basic pie crust. Cover and chill while you prep the cranberry-apple pie filling. When you're ready to assemble the pie, roll out the dough between two lightly floured sheets of wax paper, or using a pastry cloth. Using the wax paper or cloth allows you to handle the dough more gently, avoid adding more flour and roll out the dough thinner. Make sure you roll the dough big enough to drape over the edge of the pie plate. 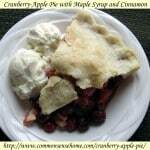 You can find more pie crust tips in the post “Best Pie Crust Recipes Plus Tips for Perfect Pies Every Time“. These crusts also work great in savory recipes, like chicken pot pie and cheese and veggie quiche. 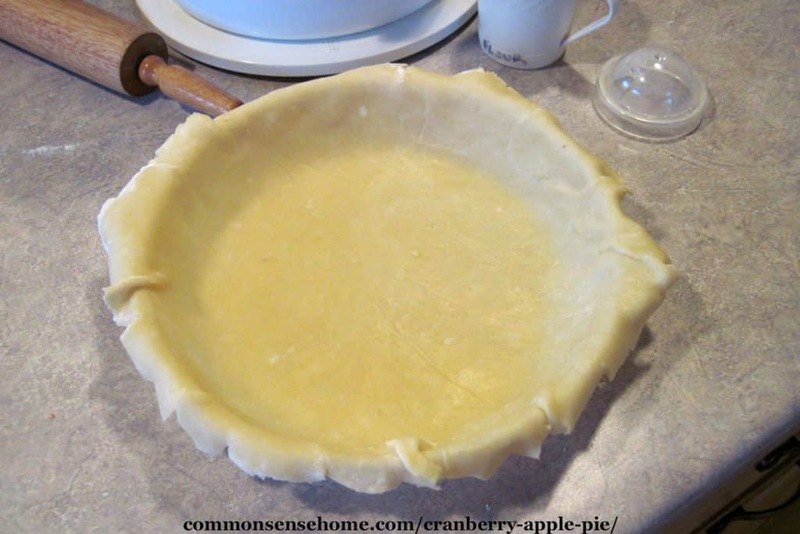 Simple pie crust recipe that make two 9-10 inch rounds. Cut together flour. salt and lard/butter with two knives or a pastry blender until mixture forms pea size lumps and is evenly blended. Pour water over flour/lard mix. Blend with fork until you can form the dough into a ball. To keep crust light and flaky, do not overwork the dough. Roll out between sheets of waxed paper lightly dusted with flour for easier handling. Dough will keep wrapped in the refrigerator for several days or can be frozen. In a large bowl, cut together flour and lard with a pastry blender to form pea sized bits. Mix the liquid ingredients in a separate bowl, then cut them into the flour mix with a fork. Work the liquid in using a fork, then finish the last bit of mixing with your hands to make sure the dough comes together evenly. Shape into three even disks and chill in the refrigerator. When you're ready to assemble the pie, roll out the dough between two lightly floured sheets of wax paper, or using a pastry cloth. Make sure you roll the dough big enough to drape over the edge of the pie plate. When I was a little girl, every holiday used to mean huge family gatherings, with baking and cooking for days leading up to the event. Mom and my sisters and I baked about half a dozen different pies and desserts, plus kolache and rolache and Hungarian rolls. The tiny house was packed to the rafters with a kids' table in the kitchen and grown ups in the living room, and people eating in shifts or grabbing any available seating to have a bite to eat. Baking always takes me back to those happy memories of working side by side with family to create a memorable feast for everyone. Now that mom has passed, I generally cook on a smaller scale, but once in a while we're able to gather the crew together and pull out all the stops. I hope you've enjoyed this recipe, and that you have a wonderful holiday season. Did you know you can find all of our holiday and dessert recipes listed on the Common Sense Recipes and Kitchen Tips page? They're sorted by category to make it easy to find just what you need. 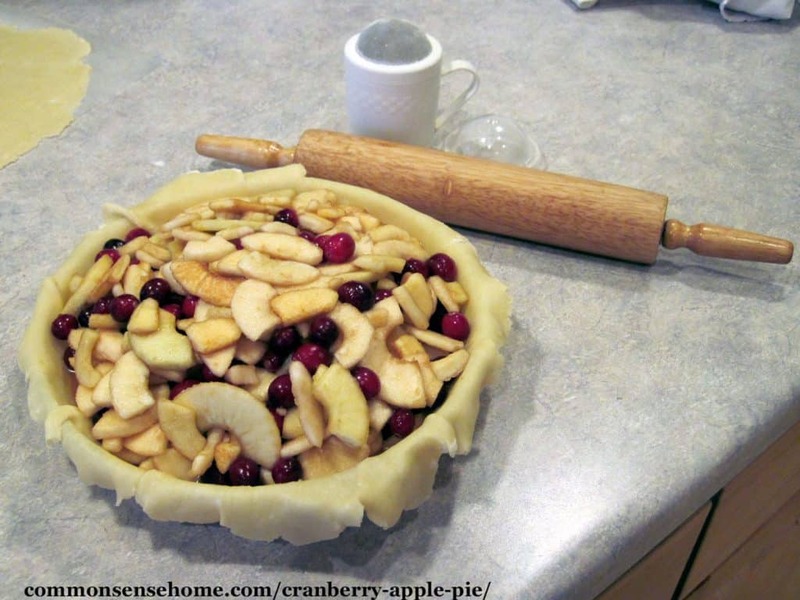 Easy Cranberry Walnut Pie – Part Pie, Part Bar Cookie, All Tasty! Thank you for visiting, and enjoy your baking. If you have any questions or would like to share some of your family baking traditions, just leave a comment below. Originally posted in 2013, updated in 2018. Thank you for the beautiful recipe! I can’t wait to give it a try. It looks perfect for holiday meals! I like the earthiness of the maple and think it makes a nice compliment to the apple and cranberries. They all seem like fall flavors to me, even though the syrup is harvested in spring. For those without their own maple syrup supply, consider visiting our family business online at http://www.sillowaymaple.com. We have a family sugaring operation in Vermont, and would love to send you a supply to cook with! 8 ounces by weight, not volume. I’ll clarify that in the post. Thank you!! I ended up putting in 1 and 1/2 cups of cranberries and it was wonderful!! AMAZING recipe!! Glad you enjoyed it and sorry for the confusion.